Nice quotes, promises full of romance and sweet memories are the things that are supposed to mark the end of one year of your marriage. Turn every stone with the aim of wishing her a Happy Anniversary. Scribble beautiful quotes on her greeting card, post lovely messages on Instagram, Facebook and everywhere else. Distract her wherever she is with flirty texts throughout the day and make her feel on top of the world. They may seem like small things but they go a long way to strengthening your relationship. Such things pave way to the wonderful journey that you and your wife will walk on together, till death do you part. 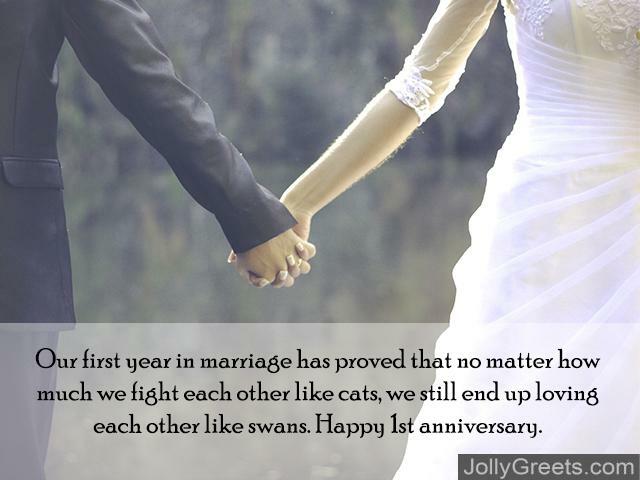 Our first year in marriage has proved that no matter how much we fight each other like cats, we still end up loving each other like swans. Happy 1st anniversary. You know its true love when someone likes your weakest, falls for you at your poorest and kisses you at your ugliest. You are my true love, thank you. Happy anniversary. May we have a million more years of surprises to throw, glasses to clink, cakes to eat, gifts to give and smiles to put on each other’s face. Happy first anniversary! True relationships are a bumpy ride, full of difficulties. They are a journey, rife with tough times and bad days; never perfect. But despite all the flaws, fights and arguments, true relationships stand out as one of the most beautiful, amazing and innocent things life ever offers. There has never been nothing like it, and never will be. Thanks for giving me mine, happy anniversary. The celebration of our anniversary will last for twenty four hours but the celebration of our lives together will last for the rest of our lifetime and beyond. Happy anniversary. I’m lost for words. All I want to say that I’m glad we’re together and you are the best thing to have come my way. I wish I could just pause time and live this moment forever. Happy anniversary. Nothing comes close to what I feel, when I hold you close. It is a silence that tickles me in the deepest corner of my soul. Happy anniversary. May the rest of our lives always be like this first anniversary – youthful, exciting and hopelessly romantic. Happy first anniversary. I am one among the few lucky men in this universe to say that their best friend, girlfriend and wife are in the same woman. A happy marriage is a relationship between a couple who understands the meanings of love, trust, commitment, sacrifice, forgiveness and honesty. Happy anniversary. On our anniversary, let us not reverie at the memories we have made, rather let’s dream of those that are yet to come. Happy 1st anniversary. You know you are in love with your soul mate when making sacrifices for someone else, makes you feel so happy from within. I love you hun, happy anniversary. You are the love of my life. May our love and faith grow every year as we celebrate our engagement anniversary. Happy first engagement anniversary, my dear wife. My world has become complete with you as my wife. It’s been a year since we came together and I look forward to celebrate more anniversaries with you. A very happy first engagement anniversary to you. Our engagement anniversary reminds me of the best decision I took of marrying you. I hope I am with you the way you wanted your husband to be with you. Happy first engagement anniversary, my wonderful wife. Let’s celebrate our first anniversary engagement with joy and love. I want to make this celebration a memorable and special one for us. I love you a lot and wish you a very happy first engagement anniversary . Our first engagement anniversary reminds me of how good my days were during the last one year with you in my life. I am very lucky to have you as my wife. Happy first engagement anniversary. I don’t need an anniversary to remind me to be thankful to you. Waking up to your beautiful face every day is the daily reminder ever. Happy first anniversary. Staying with you doesn’t feel like being married at all. It feels like having a fun and romantic sleepovers with my crush every day. Happy 1st anniversary, thanks for making our lives so perfect. Congratulations for withstanding me for 365 days. The next round of torture is about to start. Happy first anniversary. May the beginning of our marriage fairy tale eventually end with Happily Ever After. Happy 1st anniversary. Being in love taught us the meaning of loving each other no matter what. But marriage taught us the meaning of loving each other for what we are. Happy first anniversary darling. Falling in love with you was great, getting married to you was awesome. But receiving a kiss from the woman of my dreams each and every day is the best thing ever. Happy 1st anniversary. Marriage is like a see-saw. Sometimes it is up, sometimes down. But the most important thing is that we’ll have fun every single step of the way. Happy 1st anniversary. Let’s stop counting milestones, and let’s focus on just creating beautiful lifetime memories. Happy anniversary baby.